1. Multiple markets are now in the middle of runs. It makes it harder to add to positions that are in the middle. You can do it if you use stops below these levels. Giving up everything between here and the summer lows does not interest me. 2. UPDATE: GLD is now edging DOWN, not up as you can read in my Twitter feed to the right. Today GLD hit its 50 day moving average and bounced. The last time it did that, it failed the next day (Nov. 21st). Things change quickly and Twitter is the fastest technology I have to communicate with you. Gold is still in a market timing up trend over the short term. But there is overhead resistance as shown in the chart from Friday (click here for all my latest updates: Read My Feed). I commented on Twitter on Friday that the silver chart (SLV) is not as supportive as the gold chart. 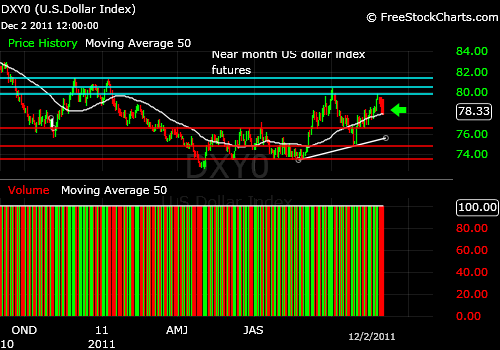 SLV could start sliding down its 50 day moving average and then break it. 4. The US Dollar is in danger of breaking on a market timing basis, but the near month dollar futures sit at the 50 day moving average, which must be broken soon (see chart below). We do have a lower high in for November as well as a break in the upward wedge I pointed out previously, so the dollar Bears have the ball overall. 5. The stock market indices have some room to rally, but won’t if the Europeans mess up in any significant way. They are still making changes to a system that are extremely awkward given the lack of a common governmental body. The ECB was obviously not well thought out as a concept. Follow my Twitter comments during the market day (link to right). 2011 Wall Street Sun and Storm Report, LLC All rights reserved. This entry was posted in gold, gold etf, investment, Market timing, S&P 500 Index, trading, US Dollar Index and tagged gld, gold etf, market timing, sp500 index, spx, spy, us dollar index, uup, VIX, volatility index. Bookmark the permalink.